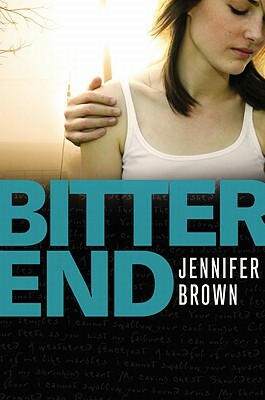 Bitter End by Jennifer Brown. Grades 9+. Little, Brown, May 2011. 368 pages. Reviewed from ARC snagged at ALA.
At first, it was sunshine and roses. Alex couldn't believe how lucky she was that a guy like Cole showed an interest in her. She was head over heels. And yeah, her best friends seemed jealous and they started drifting apart, but that didn't really matter because Cole loved her and that was all that mattered. But as Cole's "playful" shoves and pinches escalated into punches and kicks, Alex had to admit to herself that it was not okay. How could she leave him, though, when the only thing worse than being abused by him would be losing him for good? Jennifer Brown perfectly captures that elated first-love feeling. She also perfectly captures that trapped feeling of being caught in an unhealthy relationship and seeing no way out. Alex felt so real to me that I found myself yelling at her and then weeping with her and wanting to scoop her up and protect her. I have to give props for the supporting characters, too. I felt the bonds between Alex and her two best friends Bethany and Zack. When those bonds are strained by Alex choosing to hang out with Cole, to defend Cole even when he starts doing nasty things, their friendship starts to fall apart. It just all feels so real. And Georgia!! I loved Georgia, Alex's boss at the restaurant where she works. George is kind of like a mom to Alex since Alex's mom died when she was little. And when Alex thinks about reaching out to Georgia and then stops herself because she doesn't want to add to Georgia's stress or she doesn't want to disappoint Georgia, that all felt real, too. I like it when books feel real, when characters practically step off the pages to greet you. And Bitter End was definitely a story that drew me in and didn't let go until, well, until the bitter end. I'd hand this to teens who dig contemporary fiction, especially teens who were sucked into Jennifer Brown's debut novel Hate List or contemporary reads by Laurie Halse Anderson or Elizabeth Scott's edgy stuff, possibly even Ellen Hopkins, though Bitter End is not quite as issue-driven. Bitter End will be on shelves May 10!